If you want to burn calories, improve your health, mood and productivity while typing at your desk, then the DeskCycle is the bike for you. The DeskCycle was specifically designed to be used in the work environment. It has the same patented magnetic resistance mechanism as in the MagneTrainer. This insures smooth and quiet operation. Smooth pedal motion is healthy for your joints and won't distract you from your work. Quiet operation insures that you won't disturb your coworkers. Other bikes use friction resistance which is not smooth and can be noisy. 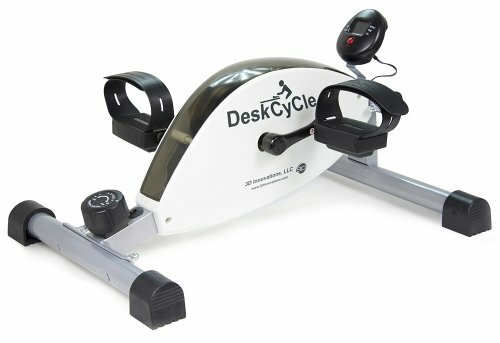 The DeskCycle has a lower profile than the MagneTrainer. The pedals are 5 inches lower than the MagneTrainer so that it will fit under desks better. It could be used at a 27 inch desk by a person as tall as 5'7". At this height you will need to push the cycle further under your desk and extend your legs. You may also need to lower your chair. If you are taller, you will need a taller desk. The highest resistance level is twice as high as the highest resistance setting of the Magneciser, and MagneCycle. At the lowest level it takes no effort to pedal it. The pedal motion is bidirectional, which means you can pedal it forward as well as in reverse. This lets you work opposite muscle groups. It comes with the Large pedals with adjustable Velcro straps. It has 8 calibrated resistance levels. We also provide an online calorie calculator on the desk-cycle website. If you have any questions about this product by DeskCycle, contact us by completing and submitting the form below. If you are looking for a specif part number, please include it with your message.